You may not have heard of them, but the Concordia cheerleading team has established itself as a formidable team of competitive athletes with a clear mission: to raise school spirit. In the midst of efforts from the Dean of Students Office to enhance student life, Concordia Cheerleading has become an example of what it takes for students with a vision to make it a reality. Managed by a group of ambitious student-athletes, this team shouldn’t be flying under anyone’s radar much longer. Paola Escudero was a full-time cellular and molecular biology student working two jobs when she started Concordia Cheerleading more than a year ago. Both Escudero and her co-captain, Lea Pandelidis, were unsure of what to expect at their first tryouts, but were overwhelmed by a turnout of almost 50 hopefuls. After forming a team of more than 20 members, the team set to work learning, practicing, and synchronizing their stunts and tumbling skills. Between September 2017 and November 2017, the team practiced on the field at Concordia Stadium with the support of former head coach of the football team, Mickey Donovan. When it became too cold to practice outdoors, the team was forced to rent space. “We had to spend the remainder of our budget on a room […] downtown,” said Pandelidis, highlighting the team’s biggest obstacle: money. While other university cheerleading teams charge membership fees and set mandatory fundraising quotas, Concordia Cheerleading only asks for members to be passionate and dedicated. In order to cover their costs, the team held multiple bake sales and bar nights throughout the year. 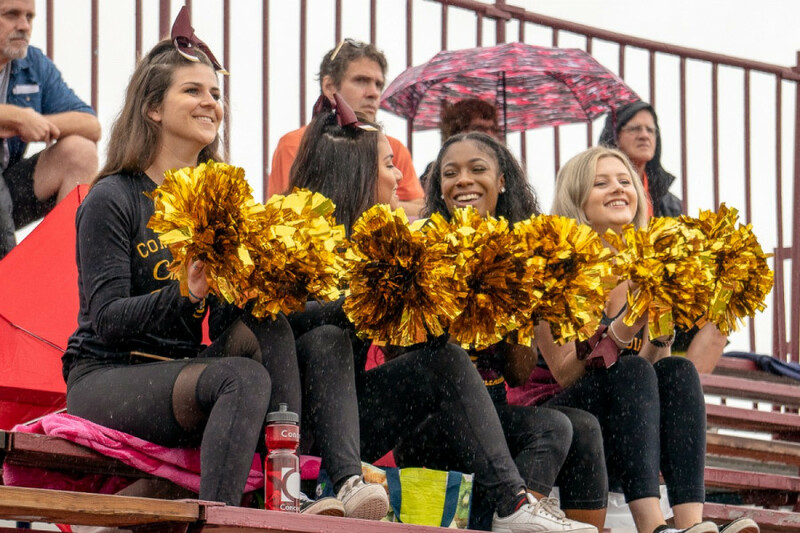 For their debut at the Concordia vs. McGill home football game last season, the cheerleaders dressed in all black, donning handmade bows and pompoms. Since their formation, Concording Cheerleading has become one of the larger clubs at Concordia, performing at over a dozen different Stingers events, including basketball and football games. In May 2018, the team received the award for Best New Club from the Concordia Student Union. Despite these achievements, the team is not well known amongst the student body and don’t feel that they are taken seriously as a sports team. Simo hopes that the Stingers community will come to see that cheerleading is something that Concordia can invest its time and money in. For many of the cheerleaders coming from athletic backgrounds and club sports teams, being on the team allows them to stay active and learn new skills, which are not second nature to a lot of the athletes who have no previous cheer experience. Concordia Cheerleading is now focused on the year ahead. Armed with new funding for the year, the team has gone into their sophomore season with custom-printed uniforms, gold pompoms, and new objectives. “This year we are focused on redefining who we are and what we stand for,” said Arianne Bellerive, who runs the team’s social media accounts and also contributes choreography for the team’s performances. They train twice a week in addition to cheering at home games and organizing fundraising events to meet the team’s financial needs. 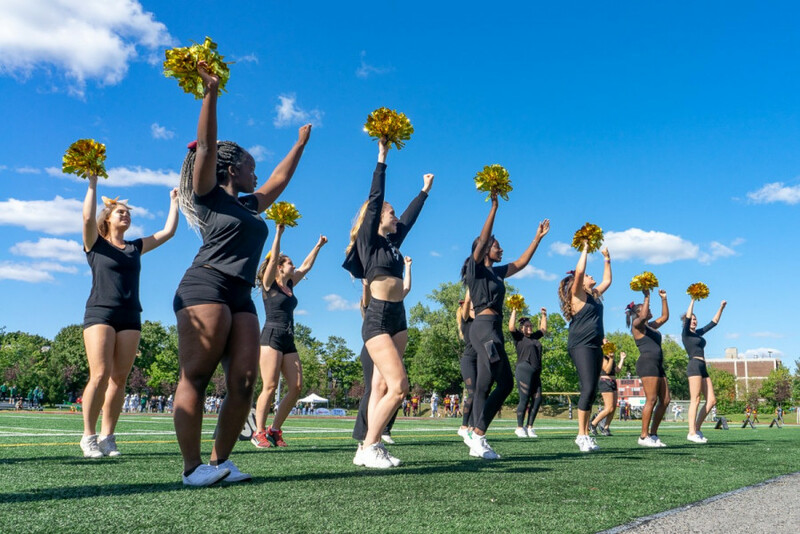 On Sept. 8, Concordia Cheerleading, in partnership with Concordia Swarm, held a large pre-game event at the Concordia Stadium with face painting, BBQ, and family friendly entertainment. It’s an effort which has continued into many Stingers events so far this season. Lea Pandelidis, Paola Escudero, Arianne Bellerive, and Ellie Paxton with their new custom printed uniforms and gold pompoms 2018. Photo Elisa Barbier. Their aim is to perform as a level 4.2 competitive cheer team (level four stunts, level two tumbling, with level five being the maximum) and also participate in a friendly competition with other university teams in the spring. Despite this new direction, Concordia Cheerleading remains committed to being open and inclusive. “If we get a bunch of girls who aren’t at the level of competing but are passionate, we’ll find a place for them. Even if it means having a secondary pompom team,” said Bellerive. Having joined the team as soon as she arrived at Concordia, Simo found a family and a place to belong on the team. In addition to training together and learning the ropes of running a student cheer team, the athletes support each other outside of the team, helping each other with their homework, exams, and raising each other up to be the best team that they can be, according to Simo. The main challenge that the team continues to face is the cost of renting training space, which is necessary in order to practice their skills and routines. In setting forth to become Concordia’s first competitive cheerleading team, the team knows that their work has only begun, and as is now clear, this is not a team to underestimate.